Dallas Cowboys rookie running back Ezekiel Elliott is denying allegations of domestic violence made in Columbus Friday morning by a woman claiming to be his girlfriend. According to a police report, a 20-year-old woman alleged Friday morning that Elliott, who turned 21 overnight, was her former live-in boyfriend and that he assaulted her in the driver's seat of her car. Police said the woman complained of wrist pain but denied medical treatment. Elliott told police he didn't hit the woman and that they didn't live together. According to the police report, a witness in the passenger seat of the victim's car did not see an assault. Three other witnesses in the parking lot also told police they did not see an assault. In the report, Columbus police said they did not arrest or charge Elliott due to conflicting statements from the victim and witnesses and because they couldn't prove whether the couple recently lived together. The police report indicated the woman was told to follow up with the prosecutor's office. The woman also said Elliott struck her several times in the past week, which he also has denied. Elliott said she got the bruises and abrasions in a bar fight. “The reported allegations and Internet postings regarding our son are completely false. Ezekiel has done nothing wrong. The police have investigated this matter and eyewitnesses have verified the lack of any wrongdoing. The actual evidence in this matter clearly indicates what the real motivation was behind the police being called. We are confident that when the truth comes to light it will reveal the falsity of these claims. Ezekiel has been fully cooperative with the police and will continue to do so—along with cooperating with the NFL—moving forward." NFL spokesman Brian McCarty said the allegations will be reviewed under the league's personal conduct policy. 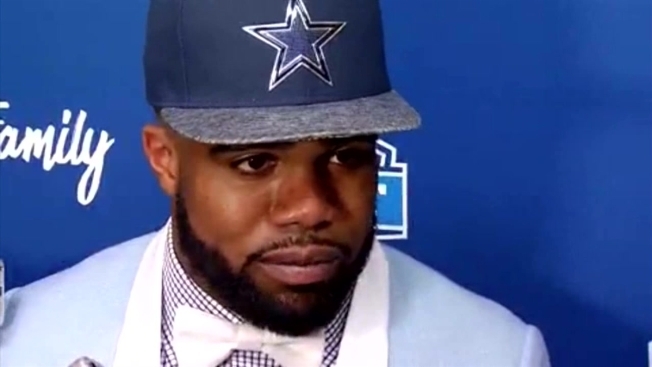 Elliott was selected by the Cowboys with the fourth overall pick in the first round of the 2016 NFL Draft out of Ohio State University. The Dallas Cowboys, who have not issued a statement on the matter, will head to training camp in Oxnard, California on July 28. The team's first practice is July 30.